Psalm 134 addresses "the servants of God, who stand in the House of God during the night," urging them to declare a blessing to the Almighty (verses 1-2). In reward for their praise of God, the Psalmist prays that God should bestow blessings upon them from <?xml:namespace prefix = st1 ns = "urn:schemas-microsoft-com:office:smarttags" />Zion, the source of blessing in the world (verse 3). 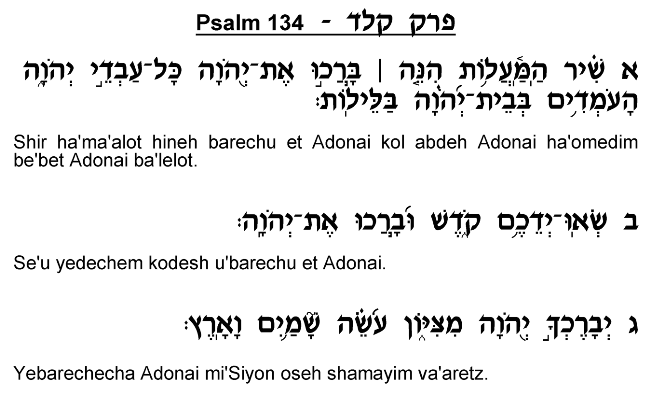 Why does the Psalmist address specifically those who frequent the Bet Ha'mikdash "during the night"? How are they different from those who visit the House of God by day? The Radak (verse 1) comments that this verse refers to "the scholars and pious ones who arise from their beds during the night and come to pray in the House of God and to give praise to His Name." It would thus appear that this chapter is intended as a warm greeting to those who chose to deny themselves the comfort of sleep in order to pray in the Bet Ha'mikdash. The Levi'im singing this Psalm extend to them this special greeting, congratulating them on their great devotion to the Almighty, and describing them as "servants of God," people are prepared to serve their Master at all hours. The Levi'im then pray that God should reward these visitors for their devoted service by bestowing upon them great blessing and prosperity. According to some commentators (Targum, Ibn Ezra), this Psalm addresses specifically the Kohanim, who "raise their hands" while reciting the priestly blessing (verse 2). The Levi'im in the Mikdash would encourage the Kohanim to praise God for affording them this privilege of serving Him in His Temple, and they conclude with a prayer that God should reward the devoted Kohanim for their diligence and faithful service.